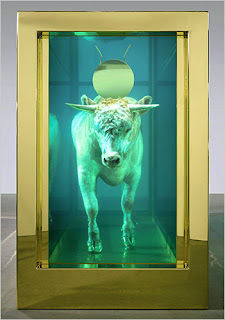 "Damien Hirst's 'Golden Calf' sold for $18.6 million last year," writes Cotter. One of my Facebook friends posted a link to an excellent New York Times article this morning. Titled "The Boom is Over. Long Live the Art!" it lays down a little bit of recent art history and shows us how the art world has gone through several other similar economic busts in this country. And what does Holland Cotter, the article's author, suggest to bring about change in this time of need? Will the art industry continue to cling to art’s traditional analog status, to insist that the material, buyable object is the only truly legitimate form of art, which is what the painting revival of the last few years has really been about? Will contemporary art continue to be, as it is now, a fancyish Fortunoff’s, a party supply shop for the Love Boat crew? Or will artists — and teachers, and critics — jump ship, swim for land that is still hard to locate on existing maps and make it their home and workplace? I’m not talking about creating ’60s-style utopias; all those notions are dead and gone and weren’t so great to begin with. I’m talking about carving out a place in the larger culture where a condition of abnormality can be sustained, where imagining the unknown and the unknowable — impossible to buy or sell — is the primary enterprise. Crazy! says anyone with an ounce of business sense.